Many of our San Fernando customers struggle with a similar problem when choosing from our selection of floor tiles: Color. People always seem to have a great idea of their budget, a good idea of the material they’re looking for, and next-to-no idea what coloration they are looking for in their floor tiles, especially for larger rooms in their home. If you’re in this situation currently, be sure to reach out to our friendly staff for personalized advice and service today! When selecting any element of your design, always be sure to compare it to samples or selections that will go into the final design before pulling the trigger. It is not uncommon for people to bring in paint or cabinetry samples to compare how the colors match up with their floor tiles. 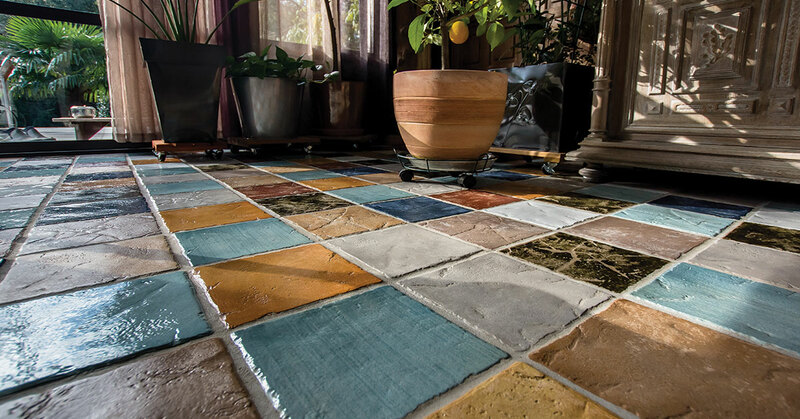 Imagine how the colors will look with your other selections, and be sure to make compromises where you can; often, that paint color customers thought was finalized is replaced because they love a certain set of floor tiles enough to re-select paint in lieu of choosing a different tile. Looking at the bigger picture can guide you in selecting the best possible look for your rooms as a whole, although you may need to be a little flexible with your initial must-have design elements. One major factor when choosing flooring colors is the room’s size and amount of lighting, especially from sunlight. Large, well-lit rooms can afford to feature a far more dark and rich flooring than a smaller, less bright space. This principle extends even beyond the ability to hold darker or lighter colors based on lighting and size: Larger, brighter rooms should feature a darker, richer, and maybe even more textured or patterned flooring than their smaller, dimmer counterparts. Likewise, smaller rooms look much larger when lighter colors, textures, and patterns are applied. Considering your room’s size and lighting is crucial for optimal appearance when it is all said and done. Many floor tiles feature brilliant patterns and textures that can be taken advantage of. All of these can dramatically change the optimal color choices for your flooring. For instance, choosing a mosaic tile can have a dramatically different appearance than the similarly colored tiles in a larger individual piece. Many tiles also feature textured surfaces, giving a wood or natural stone feel to the room; these 3D effects can play off of light and shadows in ways that other flooring elements can’t match. Choosing a floor tile’s material and color is only part of the decision, one must also choose grout coloration, pattern, size of each tile, and even the texture before settling on an option. Our friendly, local San Fernando area staff is available to help with the selection of floor tiles for any room in your home. We have the expertise necessary to help keep this from becoming an overwhelming process, and can certainly steer you away from any floor tiles that won’t look amazing when the dust settles! Get in touch with us today in-store, by phone, or online here!